Mens wedding rings have developed quickly and distinctly over the past few decades. Men today demand quality and are aware of issues involved in selecting various gems for a men's wedding ring. A mens sapphire wedding ring is one of the hot favorites for men looking for highend wedding rings. And when it comes to a sapphire men's ring, blue sapphire is surely the leader. Sapphires are tough gems, sturdy and reliable much like what you would expect a man to be. While it is true that Sapphire is the September birth stone, a large number of sapphire rings are purchased for those who were not born in the month of September. Sapphires are sturdy and durable with a hardness rating of 9. Blue sapphires are a blue color that is suitable for men. As birthstone ring, Sapphire is the September birth stone. The gem looks good in yellow or white gold. Sapphires are easy to maintain and clean. Can be worn all day. Suitable for both men and ladies, so good for wedding ring pairs. Available in a range of grades and prices, fits many budgets. Looks great as a single stone and combines well with diamonds. A great investment to make for a quality sapphire wedding ring, priced just right and encrusted with a good natural blue sapphire gemstone. Crafted in 14k or 18k gold and 925 silver. You can choose white, yellow or pink gold for your custom sapphire ring ... more. A more extravagant look for this men's sapphire wedding ring. An oval blue sapphire gem in the center is surrounded by glittering diamonds. The ring is custom made in all ring sizes, you can choose gold or 925 sterling silver for your sapphire gemstone and diamond ring ... more. One issue that often confuses buyers when selecting a sapphire mens wedding ring, is the wide variation in prices. While one of the reasons for this could be the place from where the ring is purchased, other reasons need to be understood too. If you brought a blue sapphire wedding ring for men in a posh New York jewelry store, you would be paying a fat some for the shop overheads, salesmen commissions and even for the big name of the shop. Many of these fancy jewelry houses, get their jewelry made in lesser expensive countries like Thailand and even India. They then add their margins and other extravagant overheads and make you pay for EVERYTHING including, the plush interior decoration of their shops. If a New York jeweler claims that he makes his own jewelry, he would be running production overheads that are at least 3 to 5 times more, than what a skilled jewelry workshop in Asia would cost. Buying a 14k or 18k mens sapphire wedding ring directly from a good Asian source like Thailand, would give you more value for your money. The point is that you would be paying for the material that goes into the ring and not for marketing hype and showroom furnishings! Now let us see the other reasons why the price of sapphire mens rings could differ widely. 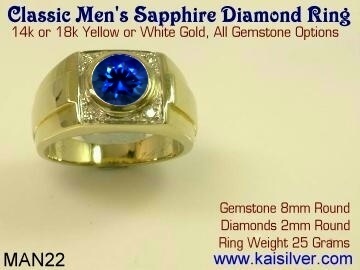 Let us take the MAN22 Kaisilver mens sapphire diamond ring as an example. This 14k or 18k sapphire wedding ring, is set with a 7mm round blue sapphire gemstone in the center. The metal mounting that holds the gemstone is provided with a hefty gold weight of 25 grams. Four diamonds of size 2mm round are add some fine glitter to this highend custom men's ring. Sapphires are available in various grades, keep in mind that we are talking only about natural sapphires and not referring to factory made fakes. The Kaisilver sapphire ring shown above is provided with a medium grade or good grade blue sapphire. While talking about medium and good grade blue sapphires, you need to keep in mind the relatively high standards that are set for Kaisilver jewelry. It is very likely that, many other jewelers would refer to our 'medium' grade as their 'good' grade. This is one of the main reasons why we often recommend to buyers with restrained budgets, to select a Kaisilver sapphire ring with a medium grade sapphire. If you do have the budget to take you that extra mile, go for a good grade blue sapphire as shown in the image by all means. The price difference between the medium and good grade sapphire is about 1,000 U.S$. The difference in quality will surely be visible but some buyers might be happy with the medium grade gem. You could customize the cost of your men's sapphire wedding ring by doing a few things. One important thing that you should understand is that, blue sapphires are not the only option for a blue gem. If you would like to get a blue gemstone wedding ring but, are not particular about the gem being a sapphire - talk to your jeweler about options like tanzanite, iolite, london blue topaz, swiss blue topaz etc. 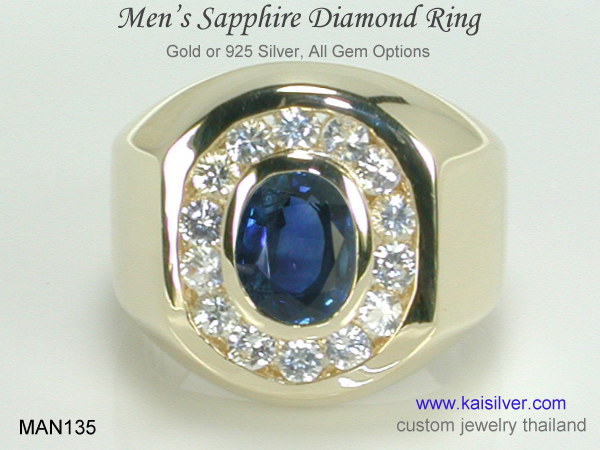 The Kaisilver sapphire mens ring shown above has diamonds set in the jewel. Diamonds are not cheap and add a cost component to the price tag. Take advantage of the high degree of customization that we provide and request, for the diamonds to be left out. You will see the price drop by around 400 U.S$ to 500 U.S$. As already explained above, the choice of a medium or good grade blue sapphire can also tune the price to your budget. If you consider the fact that you can get this handsome sapphire men's ring, with the following features in a price range of 3,500 U.S$ to 5,000 U.S$ you will realize that it is a good buy. The ring has good durability, good craftsmanship, custom cut sapphire and fine craftsmanship. A similar ring from your local jewelry shop in the U.S or Europe could cost you around 4,500 U.S$ to 7,000 U.S$. There is no point in pressing for low prices on important jewels like wedding rings. Low price will lower quality, your ring would not be sturdy and frequent repairs could ruin the jewel and put it beyond repair. Custom made in gold or 925 silver. Gold options, 14k or 18k white or yellow gold. All gem options available, request for gems not mentioned in table. Custom made in all ring sizes, design modifications possible. Can choose with or without diamonds. The portion behind the finger is 5mm. The front height of the ring is around 1cm to 1.2cm. Gold weight for the gold ring is 25 grams. Silver ring would weigh around 18 to 25 grams. Fine craftsmanship and custom cut gems for gold and silver rings. Choosing from a yellow or white gold mens sapphire wedding ring should be based on your personal liking. Blue sapphire looks good in yellow or white gold, so technically both options are fine. When talking about an 18k or 14k mens sapphire gold ring, we would like to clarify a few things. 14k gold is a bit harder than 18k gold due to the alloy composition of the metal. You could therefore say that a 14k sapphire mens wedding ring would be harder (therefore stronger) than, a similar ring made in 18k gold. Many experts are of the opinion that this difference in hardness, is not relevant to jewelry made by highend jewelers like Kaisilver. This is because the hefty 25 grams of gold provided for this MAN22 men's wedding ring, makes the ring sturdy and tough. We provide options for both 14k and 18k men's sapphire rings, and you can make a choice depending on your budget and preference. There was a time when it was taken for granted that the metal was gold when, a buyer queried about a men's sapphire gem stone wedding ring. The rising prices of gold have changed that trend, you do find orders being placed for silver sapphire wedding rings too. The point is that, the choice for gold or silver would be based on the budget allocated and what you life. For example, there are many jewelry lovers who adore silver for it's classic and calm appearance. If this is you, it is no surprise that the MAN22 would appeal to you as a men's silver sapphire ring. The best thing about Kai Silver is that, the entire design and production unit works together on both gold and 925 silver orders. This proves our dedication and commitment to crafting higend jewels irrespective of the metal selected. So you get the same choice of gems and customization options for both, gold and 925 sterling silver mens wedding rings with sapphire or other gem. If you are looking for a 925 silver sapphire men's ring, we would suggest that you leave the silver ring unplated. Many jewelers offer rhodium, gold or platinum platings on silver rings claiming that the plating will prevent the ring from tarnishing. The fact is that all platings on your 925 silver mens wedding sapphire ring will wear off after some time. The sad thing is that the wear off will not happen uniformly throughout the ring. A patchy and drab appearance awaits you once the plating on your silver sapphire ring starts to wear off. So keep away from platings. Ocassionally wipe the ring with a soft moist cloth, and this should keep most tarnish away. You also have commercially available solutions to polish silver, some of these come conveniently in the form of fabric. Your mens sapphire silver wedding ring can be cleaned with these polishing solutions. 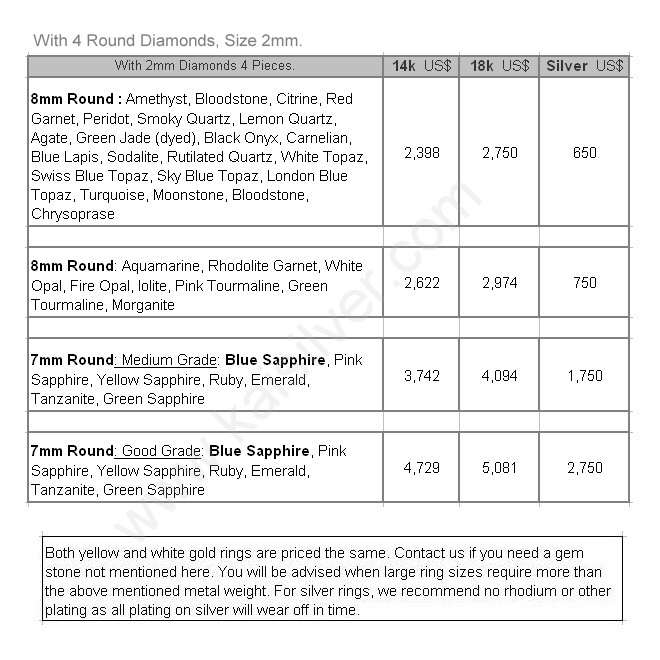 We will give you an idea of the pricing for this sapphire gem stone ring below. You can order this ring from our regular website. Click here to visit the main site, queries and doubts can be addressed to our support team at sales@kaisilver.com We mentioned that the MAN22 can be had with or without the diamonds in the ring, the price tables shows the price with both options. You can also choose the gemstone for your ring, email us if you need a gem stone not mentioned here. If you wish to order this ring, this ring please visit our regular website. Click here for accessing the page to place an order or discuss customization issues. Since each mens wedding ring with sapphire is tailor made as per your requirements, there is no limit to the degree of customization that can be incorporated into your jewel. If there is any specific detail for which you need clarification do email us at sales@kaisilver.com Our support team will provide you with advice and suggestions, there is never any obligation to make a purchase. We would therefore urge you to get the benefit of our expertise irrespective of where you buy your ring from.